Below is a photo showing a donor area of a patient who went to a well-known clinic to have a strip procedure performed to remedy his hair loss. 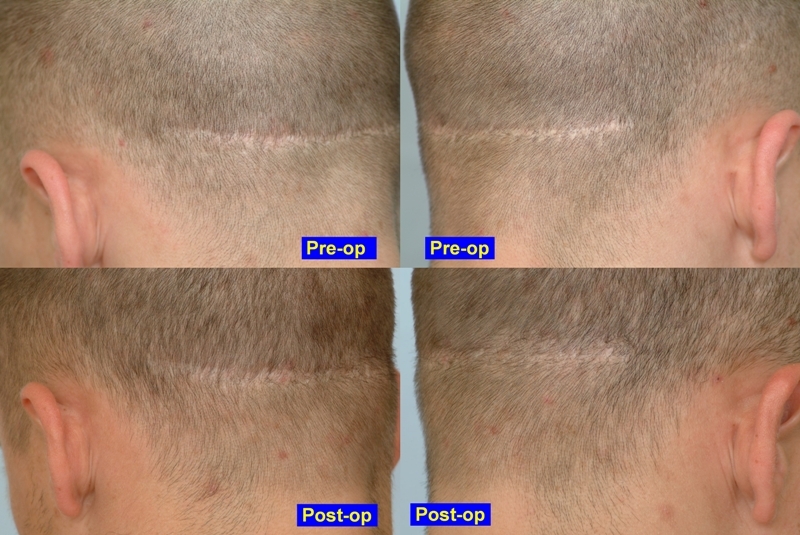 One year after the strip (FUT) procedure, the patient’s goal was not met and an unwanted strip scar remained. The patient’s new goal was to have a session of CIT grafting into the scar to improve the appearance. In the summer of 2007, this younger patient came to our clinic for one small session of CIT and test of BHT into the strip scar. 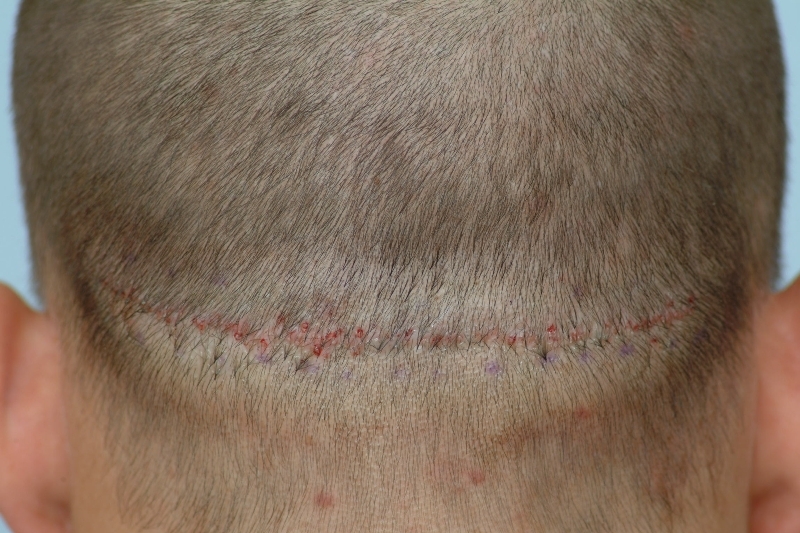 Dr. Cole’s treatment plan for the patient was to graft the scar using mostly scalp donor hair with a small percentage of leg hair to test yield of growth into the scar. Eight months later, the hair density into the scar is noticeably greater. In the first pass, Dr. Cole transplanted approximately 110 scalp hair grafts and approximately 20 body hair grafts from the legs. When transplanting into scar tissue, we have noticed that body hair tends to grow more consistently when anagen hairs are placed at lower densities (28 - 30 grafts per square centimeter). To significantly improve the appearance of strip scars, usually more than one session is usually required for optimal results. Also attached is a post-op photo showing the placement immediately after the second pass of grafting into the scar. We expect the patient’s growth to continue over time. » session of CIT and test of BHT into the strip scar. » the scar. We expect the patient’s growth to continue over time. » » clinic to have a strip procedure performed to remedy his hair loss. » » session of CIT and test of BHT into the strip scar. » » the scar. We expect the patient’s growth to continue over time. » » » clinic to have a strip procedure performed to remedy his hair loss. » » » session of CIT and test of BHT into the strip scar. » » » the scar. We expect the patient’s growth to continue over time. » also believe this patient will see more improvement after this session. Thanks for sharing this result of scar grafting. The appearence has improved significantly after 1 pass. Too many younger guys want their scars filled in but are scared and scarred. No pun intended. » » » » clinic to have a strip procedure performed to remedy his hair loss. » » » » session of CIT grafting into the scar to improve the appearance. » » » » session of CIT and test of BHT into the strip scar. » » » » the scar. We expect the patient’s growth to continue over time. » » raised scars and another plan must be executed in these special cases. » » also believe this patient will see more improvement after this session. » scars filled in but are scared and scarred. No pun intended. You are correct. The scar repair patients are more hesitant to try other methods that reduce the apprearence of the strip scar because the scarring they have already endured can be extremely difficult to have. We try our best to help these patients especially the military individuals because they need to be able to buzz down quite often.